Katherine Whaley has the skinny on parking and road closures for Pride Houston 2018. HOUSTON, Texas (KTRK) -- This weekend is the big Pride Houston parade in downtown Houston. The parade runs from 8:30 to 11 p.m., beginning on Smith and Lamar. Floats will continue down Smith before turning right on Walker. Then, it will continue down Walker until turning left on Milam. Thousands came to the Bayou City to celebrate within the LGBT community while remembering the victims of the deadly club shooting in Orlando. The parade route ends on Milam at Jefferson. Open parking is available at all garages downtown this weekend, but organizers and city officials are encouraging revelers to use the ride sharing programs. If you need help locating a nearby garage, you can see more on www.downtownhouston.org. Check out these scenes from Pride Houston 2016! 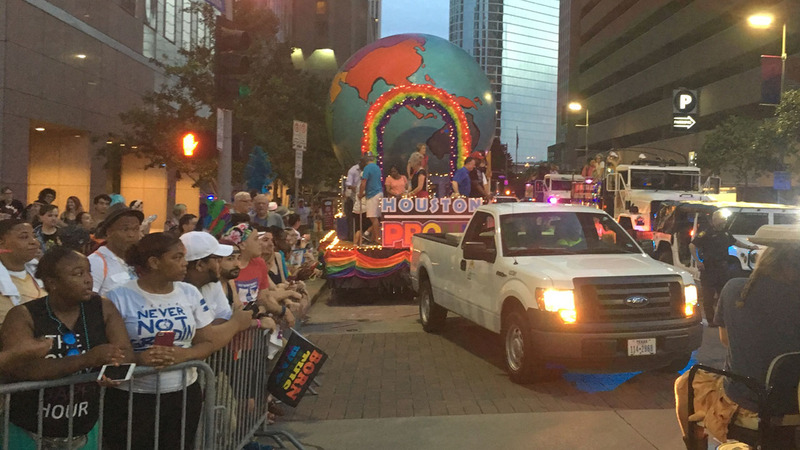 Here's some of the hottest floats and moments from Pride Houston 2016.